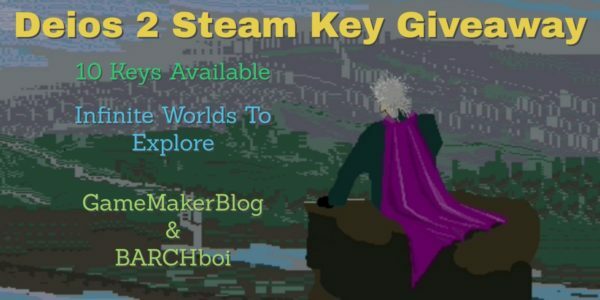 Creator of Deios II: BARCHboi, recently reached out to GameMakerBlog about the possibility of doing a Steam key giveaway to the GameMaker community. We are always willing to help any developers reach out to fellow GameMaker fans and developers so together we are pleased to announce the Deios II Steam Key Holiday Giveaway. We have 10 Steam Keys to give out and will once again be using Rafflecopter to facilitate the entries and winners. The giveaway starts 12/17/2017 @ 12am Eastern Standard Time and will end 12/27/2017 @ 12am Eastern Standard Time, official entry website can be found here. You can find further details below including the different entry options and the mirrored entry form. As usual, there is a full Official Rules document which includes fun favorites such as: no purchase necessary, void where prohibited, winners notified by email (and twitter if you follow GameMakerBlog) and other assorted legal sentences. You can read the official rules here.